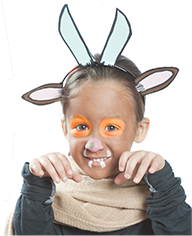 Fun and easy to make Halloween costumes inspired by your favourite children's characters. Get your child ready for trick-or-treating with these fun and easy to make Halloween costumes from their favourite books. To make terrible claws, use some old gloves and glue on paper fingernails. "Well, Gruffalo," said the mouse. "You see? Everyone is afraid of me!" Don't forget, every witch needs a broom. So they sent me a lion! The witch and her cat fly happily over forests, rivers and mountains on their broomstick until a stormy wind blows away the witch’s hat, bow and wand. Luckily, they are retrieved by a dog, a bird and a frog, who are all keen for a ride on the broom. It’s a case of the more, the merrier, but the broomstick isn’t used to such a heavy load and it’s not long before . . . SNAP! It breaks in two! And with a greedy dragon looking for a snack, the witch’s animal pals better think fast. Rod Campbell’s lift-the-flap book Dear Zoo has been a firm favourite with toddlers and parents alike ever since it was first published in 1982. This hardback edition of the much-loved preschool classic has a jacket with shiny gold foil and slots neatly into a specially designed gift slipcase.